You are here: Home Dragons Jewelry 10k Yellow Gold Blue Topaz, Opal and Diamond Dragon Fly Pendant (0.02 cttw, I-J Color, I3 Clarity), 18"
There are few things more emblematic of summer than a fluttering dragonfly. Now you can channel that summertime vibe year round with the Yellow Gold Blue Topaz, Opal and Diamond Dragon Fly Pendant. 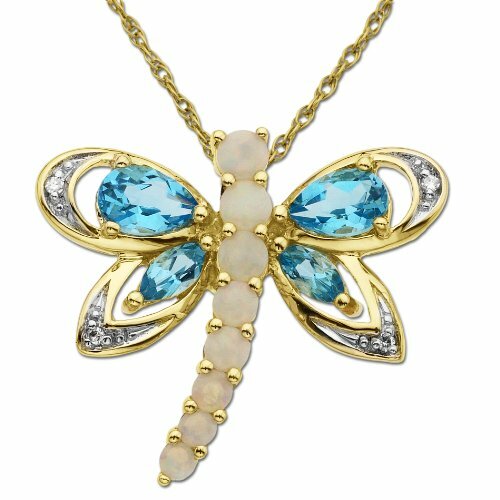 Opal makes up the body of the dragonfly, with wings set out of stunning 10k yellow gold, blue topaz, and stunning diamonds. An 18-inch rope chain easily attaches with a spring-ring clasp.